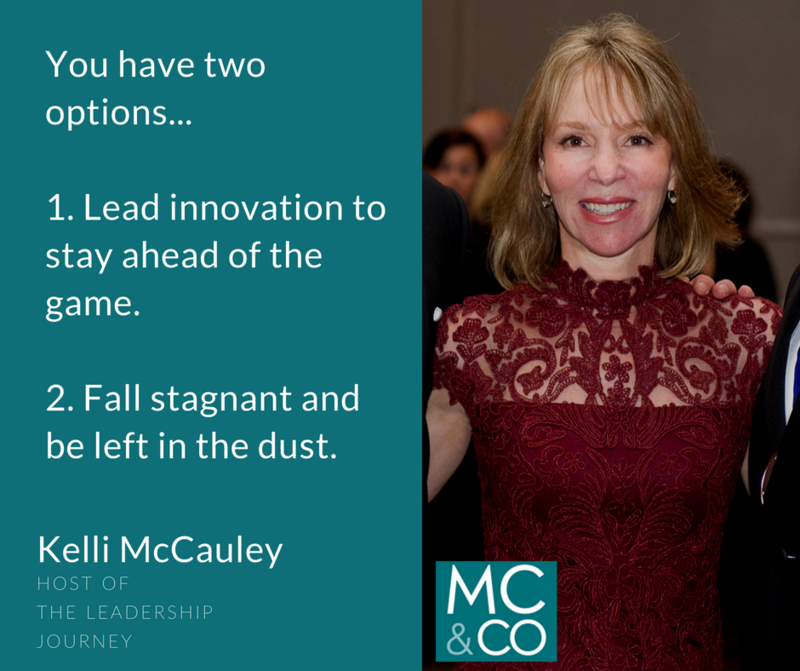 McCauley & Co.Are You Leading Innovation or Being Left Behind? - McCauley & Co.
Are You Leading Innovation or Being Left Behind? Comments Off on Are You Leading Innovation or Being Left Behind? No matter the industry, we’re living and working in a time of unprecedented and accelerating change. In this fast-paced landscape, you have two options: lead innovation to stay ahead of the game or fall stagnant and be left in the dust. Seemingly overnight, we’re witnessing industries being disrupted by new technologies, ideas or competitors that completely change the way companies make, market, sell and deliver their offerings. The irony of innovation is that people resist change, yet companies and consumers alike prize and handsomely reward leaders who can manage today’s work demands, while also embracing new ideas, encouraging improvements and welcoming change. What stops innovation in its tracks? Leaders must have courage, because innovation and change can be messy and things don’t always go according to plan. If a leader isn’t encouraging or rewarding creative solutions and failures, risk aversion rules the day. To keep fear of failure from stopping innovation, you must manage your own expectations and foster excitement about creativity, mistakes, wins and change. For innovation to root and grow, double down on your personal and professional habits – it’s tough to be creative when you are exhausted or mentally fried. Talk to your team about caring for their mental, physical and emotional wellbeing. Ask your team members if they’re getting enough sleep and talk about ways to foster a work-life blend that prevents burnout. Be curious about how people are getting exercise into their week (is it yoga, cardio, sports, walking) and serve nourishing foods at meetings to boost brain power. Adding paying attention to the mental, physical and emotional requirements of your roles creates an advantage of clear thinking, combined with the stamina needed to keep up with today’s business demands. Current research shows eighty percent (80%) of work is redundant and not creating value. Clear thinking allows you to lead your team to fine-tune your strategy and give your stakeholders what they really want. By looking at the things that are no longer serving your stakeholders and asking your team for ideas that could add value, you’ll spark the motivation for your team to consistently innovate and grow. If you want to grow fast, start with the goal of delighting and capturing the hearts of your stakeholders. Before you can do this, you must know who your stakeholders are and understand what matters to them. Part two is looking at everything you do and throwing out what no longer makes sense. All with the goal to improve efficiency. Your team must be encouraged to identify ways to do things better, faster, all with the goal of positively impacting all of your stakeholders. How can you best accomplish this to become an innovative leader? First, commit to making innovation a true part of your strategy. Think of someone on your team that is open, eager to take the initiative to grow and that is influential to your company’s success; then, appoint this person as your innovation champion. Next, stay abreast of trends to remain ahead of the game. Following futurists or trendsetters on Linkedin and reading periodicals like Fast Company will introduce you to ideas and trends that will expand how you and your team thinks about innovation. Be sure to reward the innovators on your team who are driving creativity. Take time to publicly and privately recognize their efforts. Say thank you, acknowledge what you valued about their ideas or efforts, show appreciation with Starbucks gift cards or a Friday afternoon off – all of which go a long way to encourage your team’s innovators. Don’t make the mistake of leaving innovation up to chance. Be sure to create a budget – however large or small – for your innovation strategy and regularly schedule time to focus on a solid and well thought out agenda that includes mission, goals, strategies, tactics and accountability. Make the most of your team intelligence! MIT conducted research that showed a huge competitive advantage when they challenged groups to solve problems vs an individual performer (IQ was not a predictive factor – everyone is brilliant at MIT). The teams competed in 156 trials to create innovative solutions to complex problems. What MIT discovered was that group intelligence outperformed individuals and, every team who had at least one woman, beat out teams who had none. Innovation knows no ethnicity, no gender and no race; it wants everyone to step up, weigh in and lead all to success. How can you evoke group intelligence from your team? Start an innovative think tank by inviting team members who have the right attitude, are curious, value collaboration, appreciate opposing views, have a solution-focused mindset and an adventurous streak. People who will serve to foster your team’s motivation as a whole. Ask your Think Tank members who they believe are your stakeholders, ask for ideas about delighting and capturing their hearts, listen to what they think isn’t working and the ways they think you can get better. Make sure that your appointed innovation champion and the team regularly report their ideas and updates at meetings and ask everyone to give feedback. Finally, put ideas into play and celebrate them everywhere! Remember, innovation comes from you. Both your attitude and attention as a leader drives your ability to successfully lead innovation for your stakeholders. Having a deliberate innovation strategy and budget, identifying specific goals, and encouraging innovation through a team led Think Tank will keep you and your team well ahead of the competition and thriving in our world of constant disruption!